Any emulator that runs on emulationstation will work with AM. So, I'm not sure what you are talking about. The front-end just passes the cmd line arguments to the emulator. You can pretty much cut and paste the emulationstation emulator configs with a few modifications into attract emulator configs. It's not that complicated. As to mame 2010, I can't speak for people on the retropie forums who claim to have input issues. All that I know is when I configured it through emulationstation and then used the same emulator config in attract it works like a champ. Now, I didn't test every single game because it emulates close to "8782" games but I did test all the classics like I did with 2003 and didn't experience any problems. All the emulators have their pros and cons, you just need to choose the one you feel comfortable with. Now, for neogeo games I use the FBAnext libretrocore. Alright would you be able to do me a solid and try Advmame on your setup? I can dropbox a few good working ROMS if you don't have any handy just to see if it actually is working. I am at a lose to get it going so it would be a huge help if your able to. Even if you don't install the xbox 360 driver emulationstation will still detect it and install a generic xbox gamepad that you can find here /opt/retropie/configs/all/emulationstation/ in this es_temporaryinput.cfg file. There is another es_input file as well. That said, if you installed the xbox 360 driver manually then your rc.local should look like this. If you not using wireless then change --wid to just --id. Sure, I think I still have that rom set. I got it to work. Got the games to work the videos and wheel art just need some marquees. It's all I use since advmame 0.94 does not want to work in AM, works perfect in ES though. advmame has SDL issues with hardware scaling on x-windows. Mame .78 libretro runs awesome on the RPI2 & 3. Ah so it's broken, good to know. MAME .78 has about half the ROMS that I want to use as "known issues" and fail to start or if they do start they don't respond correctly etc. And yes that is a rebuilt full set, does the exact same in Emulation Station. So I guess MAME4all if I want to use AM. Which ROMS arn't working for you? i'd like to test them. Also, Just an FYI, I built a romset using advmame roms and again using mame 172 roms and I found a ROM that didn't work. Macros Plus for example was missing files in the archive both times. This tells me the .DAT file is possibly wrong? I copied the file over manually and it worked. how big was your set after rebuilding and is it merged or split? Sorry my last message didn't post correctly. None are working in Attract Mode at all, wont even try and open them. In ES I have every one I want on my list working fine, it's not the roms that wont work. I can't get AM to open them, obviously the wrong Executable and Arg. I can't figure out the proper path to either. Can you post your working paths? I know it sounds silly but have you tried to reinstall advancemame emulator via emulationstation binary and you have the neogeo.zip bios? 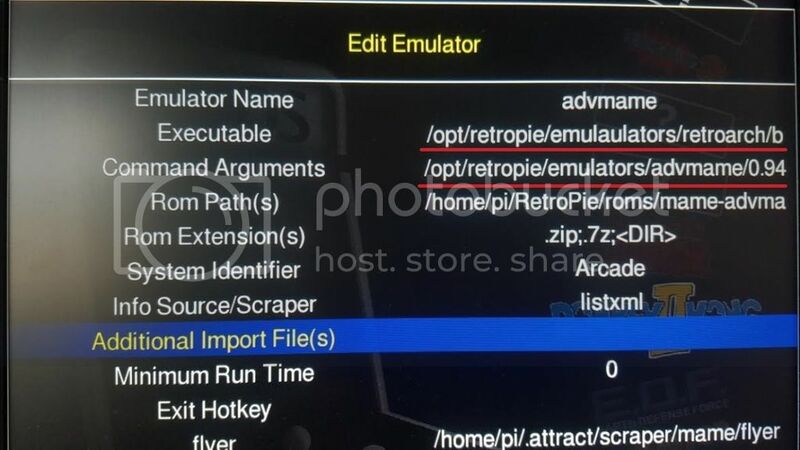 -L /opt/retropie/libretrocores/AvanceMAME.94/AdvanceMAME.94_libretro.so --config /opt/retropie/configs/atari2600/retroarch.cfg "[romfilename]"
I know it sounds silly but have you tried to reinstall advancemame emulator via emulationstation binary? It's NOT the ROMS, I have them fully working prefectly in Emulation Station. I don't need ROMS tested I was offering to load them IF Omega didn't happen to have them on hand. What I am looking for is the paths entered in Attract Mode to run the AdvMAME emulator. I have tried quit a few combonations but these are the 2 I tried that I thought might work but didn't. args -L /opt/retropie/emulators/advmame/0.94.0/bin/advmame --config /opt/retropie/configs/mame-advmame/advmame-0.94.0.rc "[romfilename]"
That one didn't work as Omega pointed out Advmame is a stand alone install not a libretrocore. So I tried his suggestion which also did not work. Thanks for the reply but that is not the information I'm looking for, trying to set this up in Attact Mode not RetroPie or EmulationStation. Looking for these 2 lines that are underlined in red. Thanks... I have Xbox 360 wireless receiver too. And with Retropie distribution (Retroarch 1.3.0), works perfectly without touch any configuration in rc.local. I try with your xboxdrv configuration but also fails. This version of Retroarch is 1.3.2 and I upgraded to 1.3.3 with same result.